Stretch marks can affect small and larges areas of the body and can range from white to red in skin tone. Stretch marks do not pose a health concern to patients, however, they are a common complaint and can be distressing to many patients. Stretch marks can affect abdomen, buttocks, thighs, breasts, back, axillae and groin areas. Stretch marks are a form of dermal scarring that happens due to stretching of the skin. They are the result of rapid weight gain or weight loss that cause structural alterations of elastin and collagen. Histology studies have shown that stretch marks appear due to a reduction and reorganization of elastin and fibrillin fibers. These studies also show epidermal atrophy, less blood flow to skin, and densely packed collagen bundles which look very similar to scars. 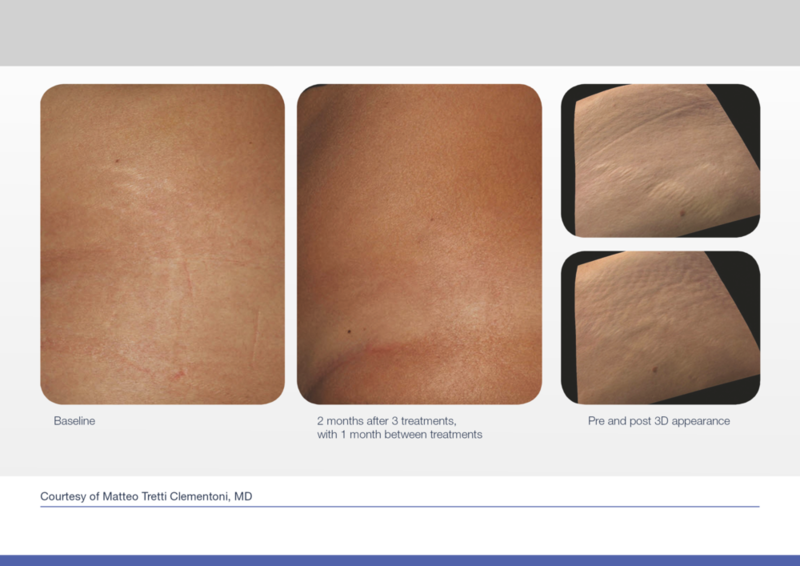 Treatment options for stretch marks. The goal of any treatments is to significantly reduce redness, swelling, irritation, and to simultaneously increase collagen production. Treatment mechanisms are adopted from treating scars. Topical medication is a common treatment that is recommended for stretch marks. However, the rate of success for these treatment protocols is unclear as protocols can differ from patient to patients and physician to physician. Common topical treatments include tretinoin and retinoids. Physical treatment interventions include the use of deep fractionated and ablative lasers. These lasers aim to trigger the patients collagen production with the aim of breaking up the scar and forcing your body to create new skin. Lasers like the Lumenis Accupulse have an FDA approval of treatment of scars. Since stretch marks are a form of scars, the same approach and concepts are applied to this skin challenge. Common lasers used are for treatment CO2 fractional lasers, IPL, and Nd:Yag lasers.